YOU THINK YOU KNOW THE TALE OF Cinderella. THINK AGAIN. The dashing Prince of the Rats–who’s in love with Cinderella–is changed into her coachman by the Fairy Godmother on the night of the big ball. And together, he and Cinderella are about to turn the legend (and the evening) upside down on their way to a most unexpected happy ending! Lady Rose, called “Cinderella” by her wicked stepmother and stepsister, isn’t the cowardly lack-wit everyone thinks her to be. With an education and a strong will of her own, she’s perfectly capable of fleeing her noble family home, Lancastyr Manor, and making her own way in life. Yet she chooses to stay and endure her stepmother’s abuse, weaving plans for taking back her home and her family’s honor. 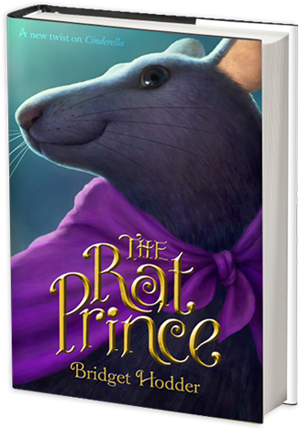 Rose never dreams she has a powerful ally in the Prince of the Rats…until the day of the big royal ball, when she changes the course of history with one accidental wish! The Prince of the Rats of the Northern Realm is dashing. He’s cunning. He’s loyal to a fault. And he feels sorry for Cinderella. So he and his rat-subjects help keep her alive when her stepmother would gladly see the girl starve. But then Char gives Cinderella a special gift…something his rat-ancestors stole from her family long ago…setting a series of magical events in motion that will change their lives forever! Wilhemina is known as “the wicked stepmother”–and she’s earned the title. She’s scary and violent and vain as a peacock. Wilhemina’s fashionable dress and proud manner cover the cruelty of her soul. But she is concealing more than just her evil nature…and Cinderella is determined to find out what!